Curiosity hits a peak as DPRK stars take center stage. 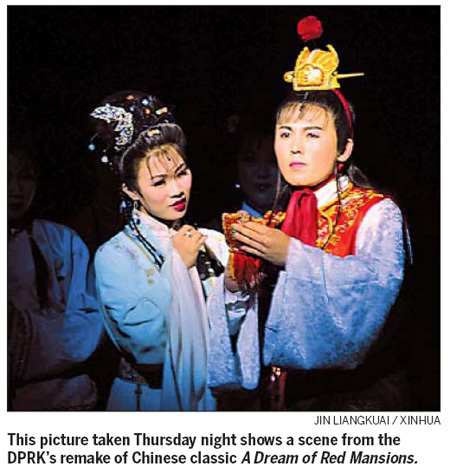 When Kim Il-hwang stepped onto the stage on Thursday night, he was not only taking part in arguably the biggest production staged in China by an acting troupe from the Democratic People's Republic of Korea (DPRK) - he was also keeping up a family tradition. The 29-year-old is one of 198 performers with the Pibada Opera Company who arrived in Beijing this week for a four-night run of the classic Chinese tale A Dream of Red Mansions at the BTV theater. It is just one of many cultural exchanges between the two countries, yet for Kim Il-hwang, the show carries extra significance. He will be reprising the role of Jia Baoyu, the central male character - the same role his grandfather played in the 1960s for an audience that included then-premier Zhou Enlai. "I would never have dreamed that, half a century later, I would follow my grandfather in taking the lead role," he said during dress rehearsals this week. As with any visit from a DPRK delegation, Kim Il-hwang and his fellow cast members have attracted much attention from the nation's media. However, rehearsals have been firmly behind closed doors and curious reporters have been given only a few opportunities to meet the stars of the show. The press conference that was held was brief and the actors refused to answer any questions that were not about the performance. The media briefing also ended ahead of schedule when Western reporters attempted to sneak backstage at the BTV theater. Before the show, it was revealed that all the Pibada actors, including Kim Il-hwang, who is a national singing star, were chosen for the roles through "a vote", although it was unclear exactly who took part in the balloting. When a reporter asked Li Jong-ran if she won the lead role of Lin Daiyu through hai xuan - a Chinese term that refers to public voting on popular TV shows like American Idol or its domestic equivalent Supergirl - the 24-year-old actress had to have the question explained several times by the troupe's interpreter. It seems the TV talent contest is still a strange concept for young people in the DPRK. "It was not decided by one leader," said Li finally, who was dressed elegantly in traditional Korean choson ot. "All the performers took part. We performed in front of them and were selected through votes." Thursday night marked the first of their four performances in the capital. Only the shows on Saturday and Sunday will be open to the public. Next week, they will take the show on the road, stopping in Hohhot, Wuhan, Changsha, Fuzhou, Shenzhen and Chongqing, before returning to the DPRK in mid-June. Pioneer Chinese govt auditor recalls challenges of UN auditing missions. China has taken a series of measures in recent months to curb prices in the residential property market, which soared 11.7 percent in March. Celebrities arrive at the Metropolitan Museum of Art Costume Institute Benefit celebrating the opening of "American Woman: Fashioning a National Identity" in New York May 3, 2010. Julia Roberts tops the list of People magazine's "World's Most Beautiful People". Do you worry over money? If you do, share with us your concerns. Shanghai a world-class city? Please.